Usually each screen has three buffers. The original buffer holds the data as first retrieved from the data base. The sequence of steps begins with the retrieval of the original buffer. The program copies the original buffer to the current buffer. The program formats each field into a temporary buffer and displays the temporary buffer on the screen. Then field by field the clerk changes the fields. As each field changes, the program keeps the new value in the current buffer. When the clerk issues the command to update, the program compares the original and current buffers in order to determine if any fields have changed. If no, the program re-cycles to the next input. corrective changes, such as a change of status, or a correction to a description. If fields did change and the relation between any of the fields is wrong, the program issues a warning and expects the clerk to make corrections or to bail out. If the buffer passes the comparison, the program locks the data base and re-gets from the data base using the keys of the original record. 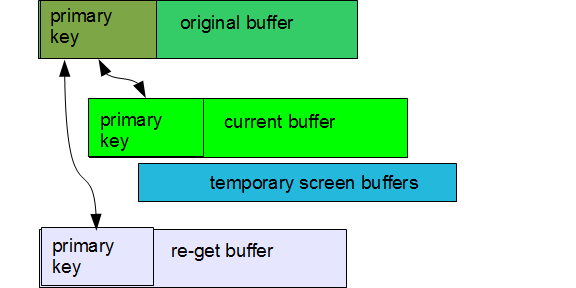 The critical fields of the original buffer must match the corresponding fields in the re-get buffer. When differences occur, the program issues a warning and re-cycles. When no critical differences exist, the program uses the current buffer to update the data base. Critical fields come in two types: absolute and relative. The status of the record can be an absolutely critical field. The clerk and the program would not make the changes to an inactive record, except to re-activate the record. So if the record became inactive while the clerk was inputting normal data, the prudent action is to declare that the record changed and re-cycle. Names and addresses might be absolutely critical. If the address changes while the clerk is processing, re-cycling is best. The quantity of inventory on hand might be a relatively critical field. If the quantity on the re-get buffer is big enough to handle the current request, then the program would continue even though the quantity does not match the original quantity.